What next for the LMS Swingbridge? Swinford lies to the south of the Swinford Toll Bridge, the main route out of Oxford to the west until the A40 was built. On the other side of the bridge is the ancient village of Eynsham, founded by the Saxon King Aethelred in the 11th Century and where OPT owns the recently restored Lords Farm. 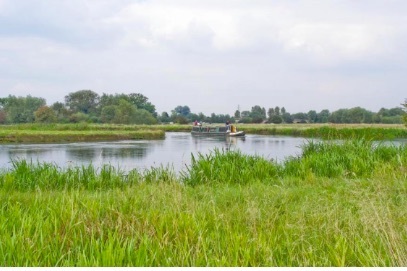 This land was bought by OPT in 2000 to preserve these water meadows where medieval ridge and furrow can still be seen from the time when it was cultivated in strips by the monks from Eynsham Abbey before 1538. This peaceful spot with its species-rich grassland is managed as hay meadow in centuries-old style, and this grazing allows the lines of the ridge and furrow to be preserved. Alongside the meadows the Thames runs in a striking horseshoe meander. Various historic artifacts have been found here including Romano-British coins, pottery, buckles, earrings and a stud; medieval and post medieval iron objects and a paved linear feature.